Governor Palin signed copies of America by Heart at Meijer in Carmel, Indiana Thursday night. Some fans camped out in the store overnight to get her autograph. A cheering crowd, many whom had been waiting all day, greeted former vice presidential candidate Sarah Palin at a Meijer store in Carmel for a book signing Thursday evening. The former Alaska governor is set to sign copies of her book, “America By Heart: Reflections On Family, Faith And Flag,” from 6 to 9 p.m.
Palin fans were lying down in the aisles of the store at 6 a.m., 12 hours before Palin’s scheduled appearance. Palin fans slept on backpacks and purses, trying to get in a little rest before the evening. Several people hoping to meet the politician/reality TV star are not from Indiana. One fan drove from Cincinnati, and a man came from Grand Rapids, Mich., a 4½-hour drive. “She’s really awesome, and she has pretty much been one of my role models,” said Brianna McNair. Terri Batts said she met Palin after her son, who had been stationed in Alaska, was killed in Iraq. Palin, who was governor of Alaska at the time, attended the memorial services. Fans said they would like to see Palin as president some day. “What she brings is exactly what the country needs right now,” said Thomas Chanteloup.. Camping overnight in a Meijer store was a small price to pay, Holly Gillham said, to be among the first in line to greet former Alaska Gov. Sarah Palin on Thursday. Some of Palin’s fans spent nearly 24 hours inside the store, with the first arriving around 7:30 p.m. Wednesday for the 6 p.m. book-signing event. Palin chatted with people as they filed past a table where she signed books and other memorabilia. Palin has dropped hints that she might seek the GOP’s presidential nomination for 2012. On Thursday, she declined to talk about her intentions, even when asked by fans. Palin’s outspoken conservative views have stirred strong opposition from critics, but everyone at the Meijer store seemed pro-Palin on this night. Overcome with emotion, Kristin Dorini, 16, of the Chicago area, clutched her book and wept after meeting Palin. Her mother, Marilyn Dorini, 53, said her daughter considers Palin a role model. Jeff Frazer, 55, and his daughter, Sally Frazer, 16, Carmel, also spent the night at the store. The elder Frazer said he shares his daughter’s political views, however. Palin was in her element. With daughters Willow and Piper, Palin is part rock star, part inspiration “It was really cool,” says Kristin Doring of Chicago. The question of the hour is will she run in 2012. “I expect her to be a contender,” said one teen on line, a line that stretched outside. The line stretched and snaked through several aisles of the store. Palin’s new book is number two on the bestseller list, behind former President George Bush new book. “She knows the Constitution and mentions a lot of documents,” says Chuck Findley reading the book while in line. Palin’s book tour takes her to critical GOP primary states like Indiana, Ohio and South Carolina with two trips to Iowa. “(I) definitely want her to run for President some day,” says an admirer. 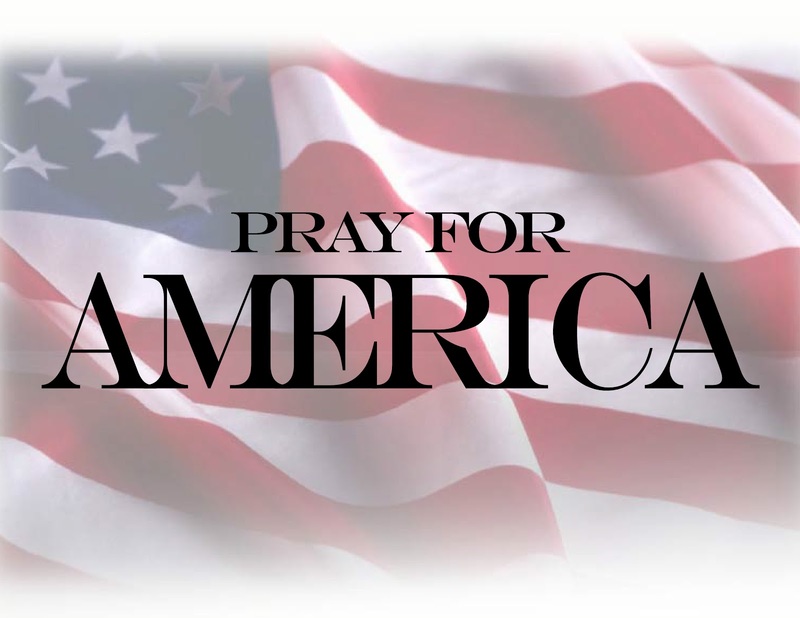 The first time I heard discussion about a Palin 2012 run for the presidency was November 5, 2008, the day after Barack Obama was elected to be the next President of the United States. The conversation has not since shifted. It has only intensified, it seems, with each passing day. It’s amazing how quickly time flies, though, isn’t it? The 2012 race is soon to get underway, and we realize that it wasn’t really that far off after all. As for whether Governor Palin wants to run, well, that’s been debated every single day since she returned to Alaska to resume her duties as governor and John McCain to Washington to pick up where he left off in the Senate. The subject is not about to change, either. The conversation has gone back and forth with crazed rapidity. When the Governor resigned from office in July of 2009, some speculated she was going to run, and she was freeing herself up for that run. Others argued that after that controversial decision she couldn’t possibly plan to run. Upon releasing Going Rogue, pundits just knew she was taking the opportunity to set her record straight so the road would be clear for a run for the highest office in the land. Other pundits said she wrote the book mainly with the hopes of exposing McCain staffers and media members who had done her wrong. When she began to travel the nation giving policy speeches and meeting more Americans, some were convinced she was planning to run, that she was voicing a common sense message to which so many can relate and counting on that message to carry her forward. There were those, however, who said, no, she’s having too much fun being a voice crying in the wilderness, so why would she put herself through the rigors of another merciless campaign? She’s definitely running, some said, when her PAC began releasing Mama Grizzly and Tea Party videos full of the faces and the fervor of a nation desperately desiring true change. Nonetheless, others maintained she was simply setting up public servants to take leadership roles as her PAC raised record money so conservatives could take back Washington. And with the emergence of “Sarah Palin’s Alaska,” observers have declared that the Governor is doing more than than just sharing her family and her state with America; she’s showing us who she is, the upbringing she’s had, and the state resources she is so ready to introduce to the nation at large–as President of this nation. Doubters, like Karl Rove, however, see the “reality show” as evidence that she could not possibly be seriously contemplating a run. Obviously, the will she or won’t she? question has been beaten to death as badly as Governor Palin beat that halibut in the second episode of “Sarah Palin’s Alaska,” and I’m not sure anyone truly knows the answer, except, as her friends and family in her home state say, “God and Todd.” Today, however, AWR Hawkins, writing for Pajamas Media, gives a different take on it. He neither subscribes to the notion that she will run nor the notion that she won’t run. His angle is this: she’s already running. Counting her time on the national stage as a vice presidential candidate with John McCain, America has had over two years to watch Palin speak from the heart, while listening to Obama speak from a teleprompter. They’ve heard her relentless calls for a strong military, while watching Obama try to appease (instead of destroy) terrorists the world over. They’ve heard her defend the free market, while living with the ramifications of Obama’s stimulus package, nationalization of industry, and takeover of health care. The American people have even seen a microcosm of a Palin-versus-Obama matchup via the 2010 midterm elections in which 30 of 43 of the House candidates she endorsed won, as did 7 of the 12 Senate candidates she supported. Moreover, those elections proved that while rank-and-file citizens largely support Palin’s worldview, they are rejecting Obama’s. So while the pundits guess, stabbing blindly into the air in an attempt to come up with proof of whether Palin will or won’t run, the rest of us should just sit back and watch her go, because she’s running for the White House right now. And if I had to place a bet on who wins in 2012, my money would be on Palin. If AWR Hawkins is right, then as the nation habitually discusses what Governor Palin might do in 2012, she’s marveling at the fact that we haven’t yet noticed she’s already doing it. That’s just one person’s perspective, but it’s an interesting one, is it not? 9.8 headline unemployment “surprisingly” announced today-the rate of real unemployment is tragically much higher-is the ultimate confirmation of President Obama’s failure. The other thing that has changed since I wrote the original article is that as Obama is clearly descending-by any measureable parameter, so Sarah Palin is, by the strongest contrast, ascending. Contrast the image/public perception; Leadership, Palin strong/Obama weak. Standing up for and fighting uncompromisingly for ones absolute principles, Obama weak (and even the radical left would agree with that summary as they head towards a primary challengeto him)/Palin (it goes without saying) strong. Having the “common touch”,Obama-well it is a ridiculous category for him when “aloof” is one of the kindest descriptions lately/Palin-just look at the lines of hundreds waiting out all night in the cold for a few seconds with, as Bryan was described, “The Great Commoner”. These are just a few examples of the stark contrast between these two as they move in opposite directions at great speed. Obama is a caretaker president like Fillmore, Pierce and Buchanan whilst we wait for the agent of change”. Like Pierce Obama will be a one-termer and perhaps the only good thing we can hope for is that he will have cleared the ground for the true exponent of hope and change, President Palin. Let’s hope in the remaining two years he doesn’t emulate Fillmore, who is considered a laughing stock, their is nothing to laugh about frankly. You know you are in trouble when even the foreign press says your credibility has hit “rock bottom” as is the case with this report in England’s “Telegraph” from their Washington based correspondent Toby Harnden. Harnden points to Obama’s “soporific” press conference and his disastrous handling of the BP oil spill-which Harnden contrast poorly with G.W. Bush’s Katrina role-pointing out that in the same duration, 39 days, Bush had visited the Katrina sites 7 times compared to Obama’s 2 Gulf area visits. However the best aspect of the piece is the pithy comment from a reader. Trust the British for the best in ironic humor, (if humor it sadly is) which advises that Obama has gone well past the most recent of incompetent presidents and is now surpassing what are considered two of the most incompetent presidents of all time. Tune in to “Sarah Palin’s Alaska” this Sunday at 9pm ET/8pm central on TLC to see how we fill our freezers and feed our families with home-grown tundra-roaming Alaskan wild game. We’ll show you how Alaskans hunt. As my friend Sue says, “the tundra is the type of landscape that will make a man out of anybody.” And, PETA…, please remember: Alaskans eat, therefore we hunt. You’ll also see us hunting at the edge of ANWR, where you can see the uninhabited lands that warehouse billions of barrels of American energy supplies underground just waiting for the political will to allow responsible resource development. Governor Palin signed over 1000 books at a Walmart store in Spirit Lake, Iowa yesterday. Fans from at least three states attended the event, and local officials met with Governor Palin before she started signing books. A representative of one GOP group invited her back for one of their events. It’s a good thing the superstore — combination department store and grocery — never closes. More than 25 people stayed here overnight to be first in line to meet the former Alaska governor and 2008 Republican vice presidential nominee. While others stand alongside pink sweatshirts and bluejeans, a group of bleary-eyed fans of the prospective presidential candidate near the front got to watch movies in the store’s electronics department overnight. More importantly, they got to stay out of the sub-freezing air in northwest Iowa Wednesday night. 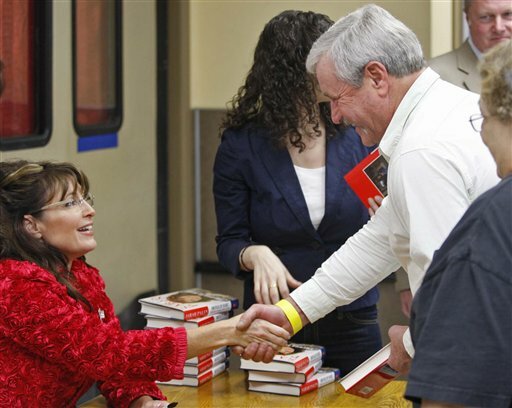 The book-signing, scheduled from 11 a.m. to 2 p.m., is part of Palin’s 16-city tour, that started on Nov. 24. Palin was in West Des Moines on Saturday, signing at the Border’s in the suburb of Des Moines. The Spirit Lake event is in the smallest city of the tour: Population 4,500. But it’s nestled in the heart of a rural tri-state area that has drawn fans from nearby South Dakota and Minnesota, judging by the license plates in the crowded parking lot. The event is also near the Republican epicenter of GOP-heavy northwest Iowa. Registered Republicans outnumber registered Democrats 4,725 to 2,966, according to updated statistics released by the Iowa Secretary of State Wednesday. No coincidence that Palin chose Spirit Lake, Iowa GOP observers said. Iowa’s leadoff presidential caucuses are scheduled for a little more than 14 months from now. Palin has said she’s weighing a 2012 bid. And the Iowa stops on the book tour have fueled that speculation. Brad Paisley’s song “Celebrity” played in the background during one segment of Thursday’s book signing at Wal-Mart in Spirit Lake by former Alaskan Governor Sarah Palin. For Spirit Lake, a town of around 4,500, Palin looked the part of a celebrity. Hundreds of fans waited long hours-some arriving the evening before-for a chance to meet the 2008 Republican vice presidential candidate for just a few moments. Palin is on a 16-day tour to promote her second book “America by Heart: Reflections on Family, Faith and Flag.” Spirit Lake is the smallest town on her tour. The goal for Palin was to sign 1,000 books over a three-hour period from 11 a.m.-2 p.m.
Palin did not meet with the media. Twenty-one media representatives including Dickinson County News, a Carroll newspaper, the Worthington Globe, CNN and KTIV were taken in groups of three to where Palin was signing books in the back of the store. However, they were only allowed to take photos and videos-no questions as Palin greeted those seeking a signed book. CNN reporter Jim Acosta broke ranks asking Palin if she was closer to announcing her run for president. Palin responded negatively. The CNN crew was then asked to leave the signing area. Prior to the book signing. Spirit Lake mayor Blain Andera and councilman Jeff Thee were part of a local delegation that met briefly with Palin. “She was very congenial,” said Thee, who said he offered Palin a picture his daughter Reghan Thee, had submitted. Others also said they enjoyed their visit with Palin. “I thought she was very friendly-very personable even for the brief moment you get with her,” said Andrea Miller from Milford. Miller said she was surprised to be able to arrive at 9:30 and still get a book signed. Kevin Young was one of several Estherville residents. Lynnae Latham, new president of the Dickinson County Republican Women, was among about 10 Spirit Lake residents chosen by Mayor Blain Andera to meet privately with Palin at the start of the book-signing event at Walmart in the northwest Iowa town. During the brief encounter, Latham invited Palin to her group’s annual summer event, Latham said. “We just told her if she planned to come back next year that we’d love to have her at our event,” said Latham, who is also the daughter-in-law of Congressman Tom Latham, an Ames Republican. Palin has said recently she is weighing a 2012 bid for president. But in two earlier visits to Iowa this year, she has not made the contacts with party activists and officials in the leadoff caucus state that many of the other Republicans mentioned as presidential prospects cultivated during the recent midterm campaign. And Palin gave no indication whether she would be back any time soon, Latham said. In that way, Palin’s event Thursday was much like the book-signing she held in West Des Moines on Saturday, part of a 16-city tour that ends in Columbia, S.C., Friday. In Spirit Lake, Palin signed more than 1,000 copies of her book “America By Heart: Reflections on Family, Faith and Flag,” in the space of less than three hours. Palin worked very quickly. An aide slid book after book to Palin, who kept the black a Sharpie marker moving while asking each person in line their name, their occupation and where they were from. Two of Palin’s three daughters, 16-year-old Willow and 8-year-old Piper, were with her at the stop, as they have been on most of the tour. Palin should expect political questions when venturing into northwest Iowa, said Chuck Laudner, a GOP strategist from Rockford, Ia., and former executive director of the Iowa Republican Party. Dickinson County is part of the Republican epicenter of the state. In the county, registered Republicans account for 4,725 voters, and Democrats, just 2,966. “If you pick Spirit Lake, you’re either running for president, or you want people to think you are running for president,” Laudner said. The country music that Palin’s handlers had blaring at the signing station presumably to drown out such questions suddenly stopped. We asked the question again. “Am I doing interviews?” the former Alaska governor asked. “I thought I got to talk to the nice people. And where’s our music and where’s our good enthusiasm?” she persisted. We repeated the question. “Not any closer. No,” she responded. With the music still off, we squeezed in another question about former Massachusetts governor Mitt Romney’s comments on Wednesday night’s “Tonight Show with Jay Leno.” On the program, Romney seemed to take a jab at Palin’s decision to step down as Alaska’s governor. “It’s hard to imagine a circumstance where I would quit,” Romney said. As of today’s book signing, Palin indicated she hadn’t heard Romney’s remarks. “What did Governor Romney say on the ‘Tonight Show’?” she asked us. Upon hearing his comment, her response was brief. “Oh, he probably had some different conditions,” she said. It was an apparent reference to the controversies that swirled around her final days as Governor including ethics complaints and a legal dispute over a state trooper who was once married to her sister. Palin’s actions were cleared by a state board investigating the matter. In her resignation speech last year, Palin suggested that costly legal battles had forced her to step down. There was no opportunity to follow up on Palin’s comments at the book signing. This CNN crew was informed our allotted time to cover the event was up. The event itself was tightly controlled. Customers were told no cell phones or cameras. Representatives of the media were escorted in to Palin’s book signing station, three at a time. As for that music, Palin asked us if we had turned it off. “Because that wouldn’t be cool if you did. These Iowa people, they got my back. And I got their back,” Palin said after one of her handlers put her hand in front of our camera. The turnout at this stop on Palin’s book tour was a sign of her continued political strength. As Spirit Lake’s Mayor Blain Andera noted, more than 500 people stood in line for Palin’s autograph in a town of roughly 5000 people. Andera said he was leaning toward supporting a Palin presidential bid. Another Palin fan, Shannon Dunham started camping outside of the Walmart at 3am for an autograph. “She’s just a generational, iconic figure and a great example for our girls,” Dunham said.